Social media giveaways and promotions are always a big hit. Use those nifty tools in the Snapchat app to share a secret discount code with followers. Or host a contest the way beauty retailer Sephora did. The brand, already known for its successful digital and mobile endeavors, hosted an Eyebrows on Fleek #SephoraSnapsSweeps, giving followers a chance to win a $500 Sephora gift card for drawing fake eyebrows on a selfie, using Snapchat’s doodle feature. 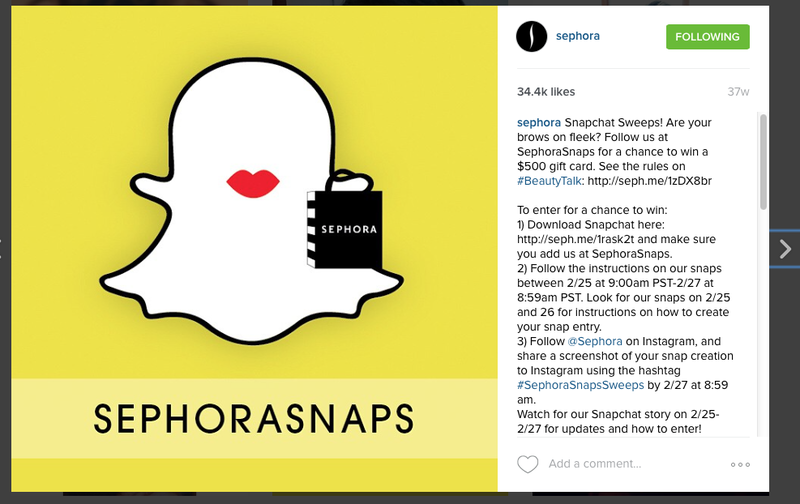 Users were encouraged to screenshot their snap and upload their photo to Instagram using #SephoraSnapsSweeps. This is a great example of using one social media channel to encourage engagement on another one, because it drove consumers to follow Sephora on Snapchat and Instagram. 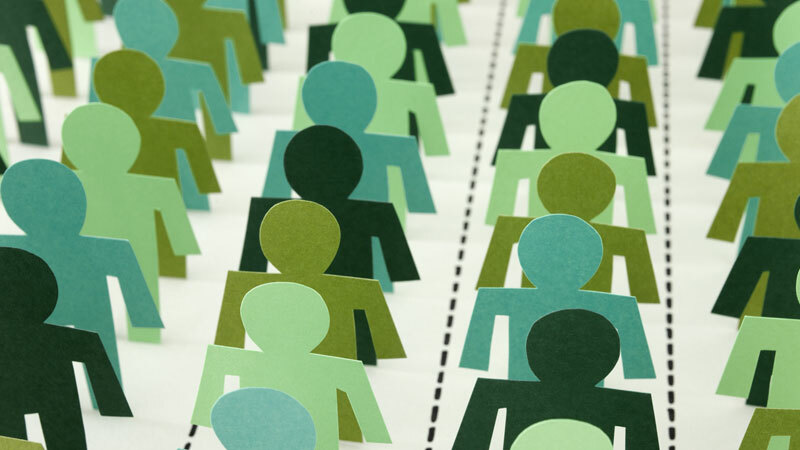 It created excitement around user-generated content, allowing users to connect with the brand and each other. The online and mobile food ordering company GrubHub uses Snapchat to share coupons, giveaways and candid behind-the-scenes shots. The beauty of offering promotions and coupons on this app is that all the offers have a time limit; they automatically disappear after 24 hours. 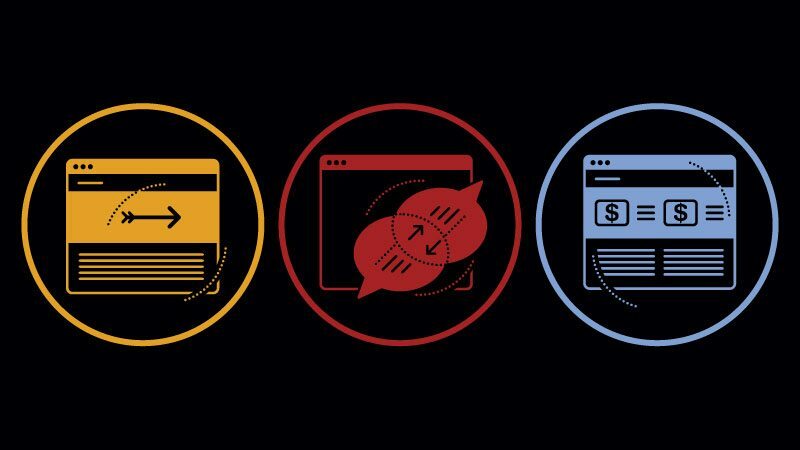 That means users will be spurred to follow your brand so they can stay up to date on the current offers. 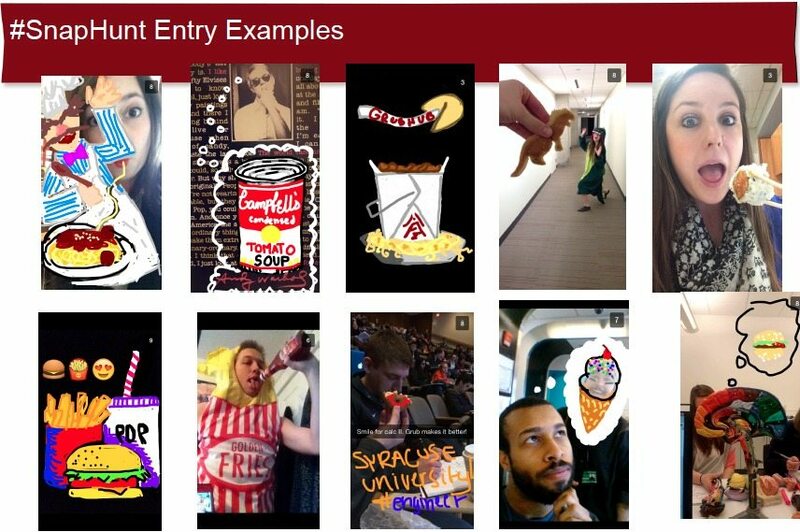 In 2014, GrubHub hosted “SnapHunt,” a weeklong scavenger in which followers were asked to compete for a chance to win $50 in free takeout. Almost a third of GrubHub’s followers participated, and its followers grew by 20 percent during the campaign. Snapchat gives brands the opportunity to provide exclusivity and one-on-one interaction with followers, so it can feel more personal than other social media channels. It provides a sense of urgency and indulges the here and now, which is a great asset for any brand to have. Followers like to feel special, and have exclusive access to new content or products that have yet to debut. It’s why HBO’s Girls broadcast teasers on Snapchat. It’s the perfect opportunity to remind audiences of an upcoming episode or when a new video is available. 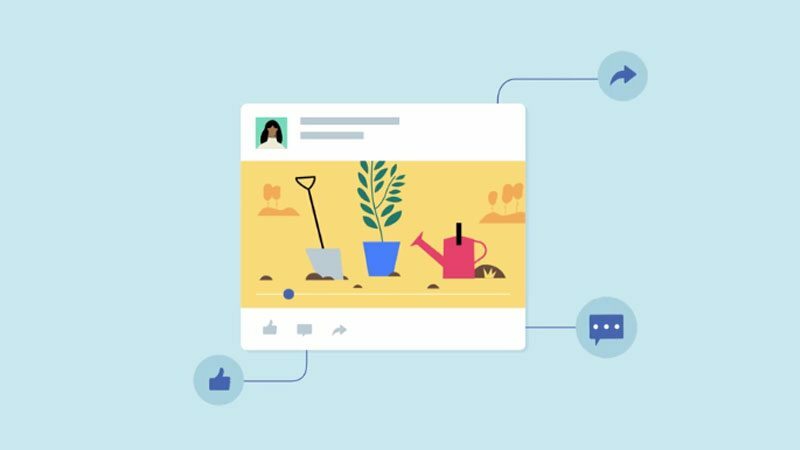 It also gives viewers a sense of personal connection—they’re getting content that’s just for them. 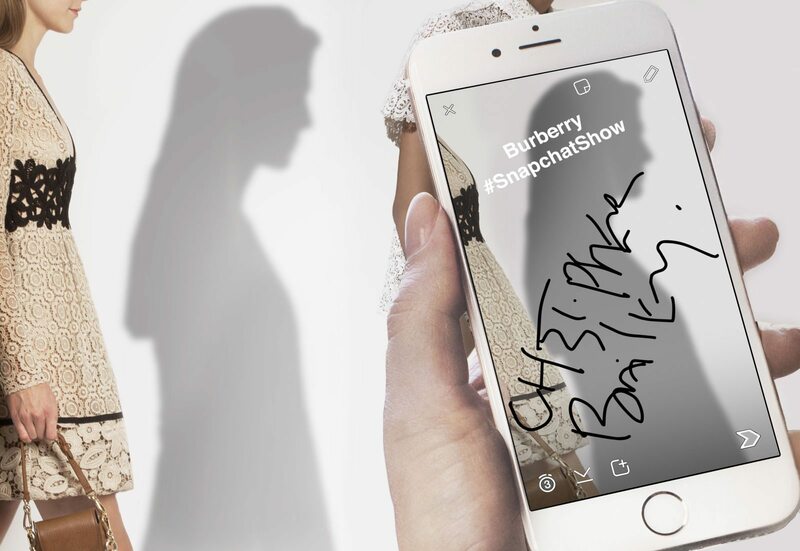 During London Fashion Week, Burberry used Snapchat to reveal its collection a day before it hit the catwalk, along with exclusive Anna Wintour cameos. The brand posted some fun behind-the-scenes content, which included a video of their bike messenger delivering invitations. By engaging with their fans this way, Burberry was able to build excitement about the event and their new collection, while also rewarding followers with unique content they wouldn’t get anywhere else. The use of Snapchat at Fashion Week made users feel they were part of an exclusive world — even if they weren’t there. And it made Girls’ fans feel like they were getting an insider’s peek at their favorite show before it aired. This approach can work for nearly any brand or product. Opening a new store? Give an exclusive tour. Releasing a new lipstick line? Show Snapchatters a beauty tip using the new colors before they hit store shelves. Snapchat can be used to share timely reminders about events, videos and product launches. And when this is done in combination with other social media channels, it creates an ongoing dialogue with fans that keeps them engaged and coming back for more. To learn more about how Snapchat can fit into your content marketing strategy, check out this Snapchat POV from Pace.